Resting 12-Lead ECG Hillmed HM-Cardio MD. 5 Quick ECG ECG Acquisition for a few seconds. ECG, Time, and Heart Rate are displayed. 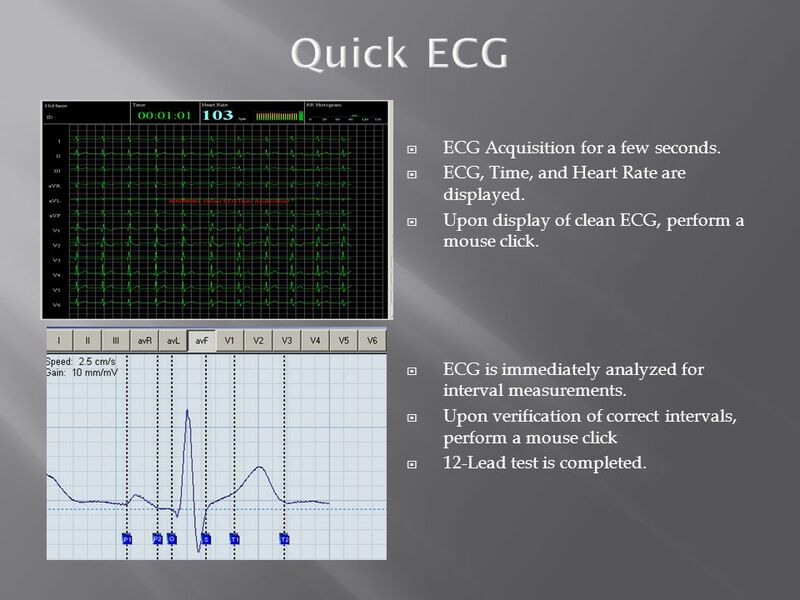 Upon display of clean ECG, perform a mouse click. 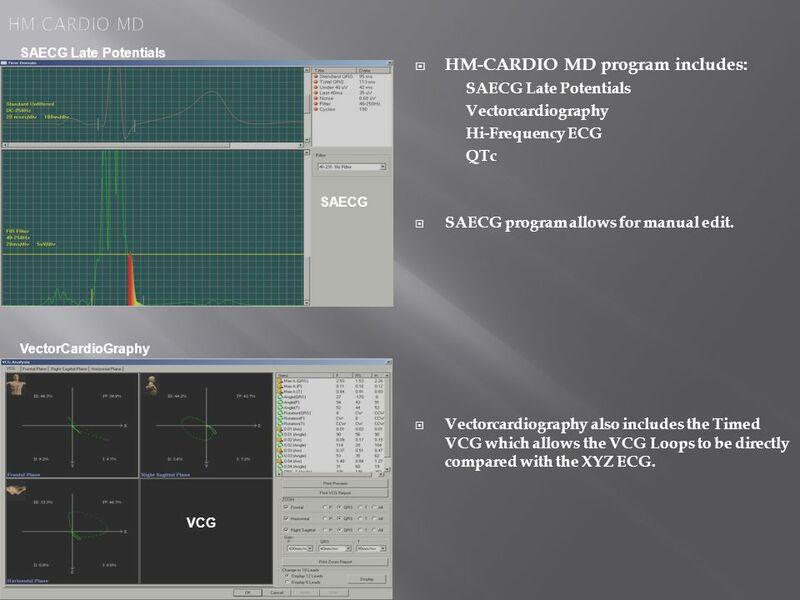 ECG is immediately analyzed for interval measurements. Upon verification of correct intervals, perform a mouse click 12-Lead test is completed. 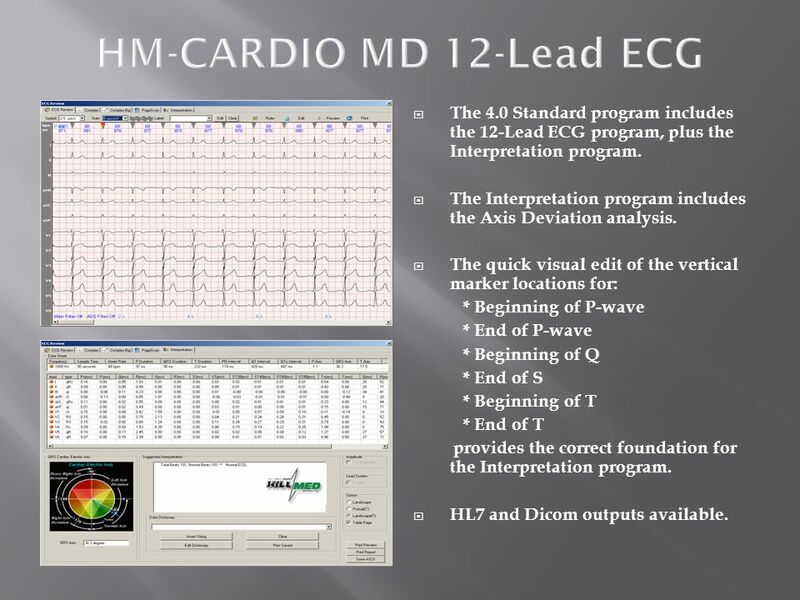 7 HM-CARDIO MD 12-Lead ECG The 4.0 Standard program includes the 12-Lead ECG program, plus the Interpretation program. The Interpretation program includes the Axis Deviation analysis. The quick visual edit of the vertical marker locations for: * Beginning of P-wave * End of P-wave * Beginning of Q * End of S * Beginning of T * End of T provides the correct foundation for the Interpretation program. HL7 and Dicom outputs available. 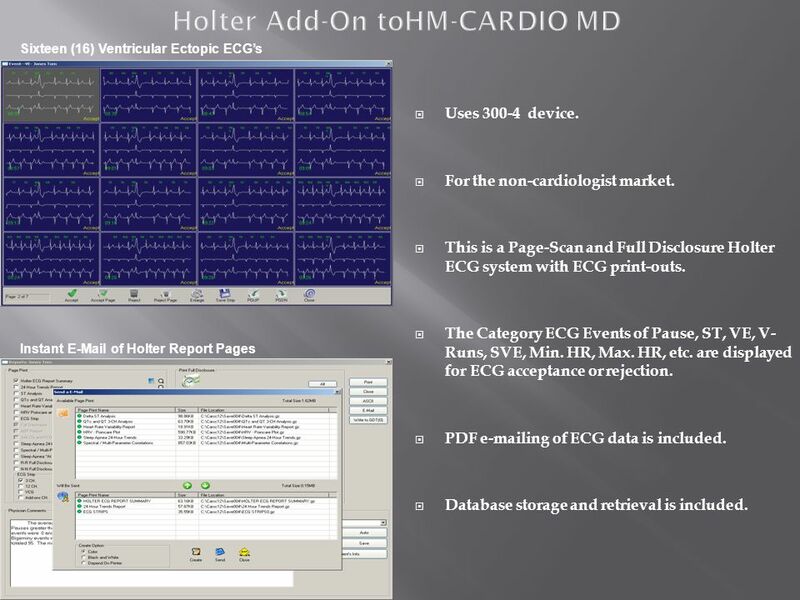 * Interpretation * Simple Stress Test * SAECG Late Potentials * QTc & QTd * FrequencyCardioGram (FCG) * Multi-Hour ECG with HRV * Hi-Frequency ECG * VectorCardioGraphy (VCG) ECG Acquisition is with: * Blue Tooth Transmitter (100 meters) * USB Hi-Res Acquisition Box * HM-Holter MINI-Recorder A low-cost and simple Holter CS-6A program is an optional add-on to the Winnervision program. 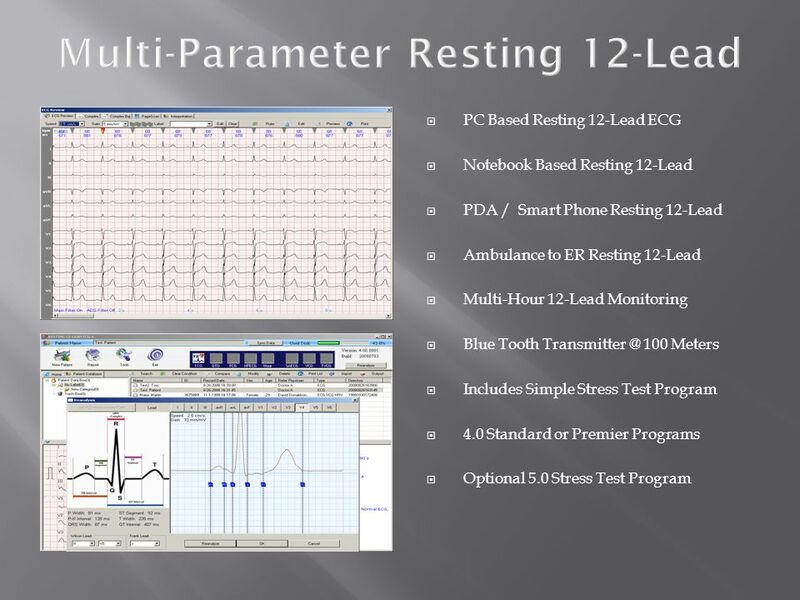 Blue Tooth sends 12-Lead ECG to PDA or Smart Phone (PSP), with the Resting 12- Lead software. PSP displays, analyzes, stores, and has printer outputs for the 12-Lead. 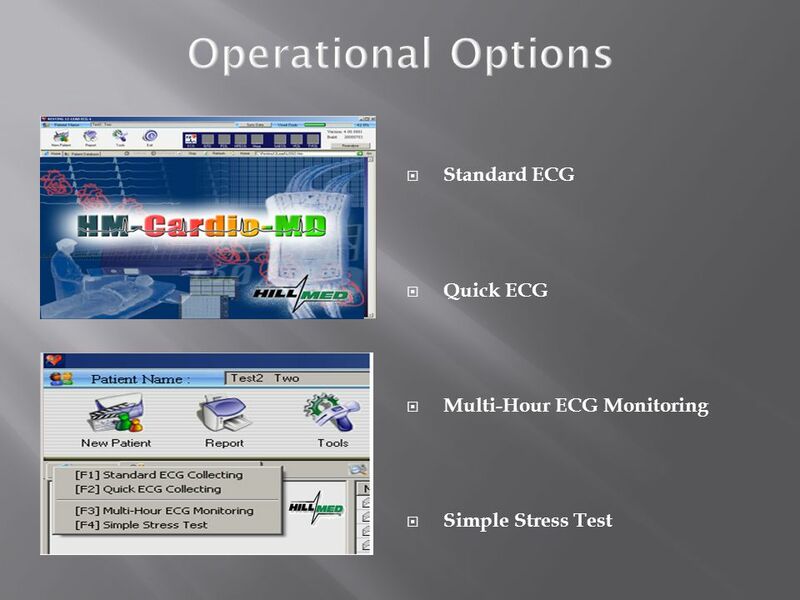 ECGs can be collected for a large number of patients, and then transferred to the 12-Lead PC station in the hospital’s EKG Lab. 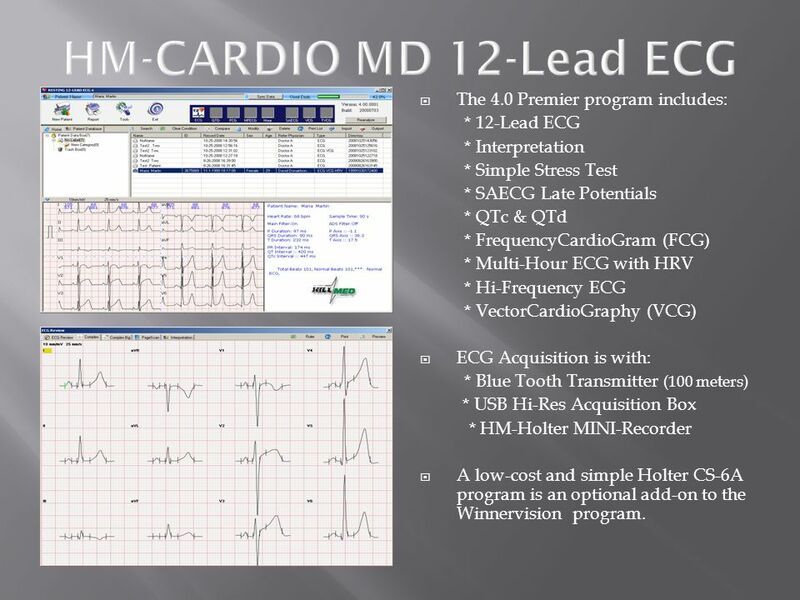 12-Lead ECG strips can be ed to PCs or other physicians. This makes for a pocket ECG system that the physician can take into any out-of-the-office environment. Ideal for sports medicine and Ambulance monitoring environments. Ambulance to hospital ECG for immediate treatment of cardiac patient emergencies. Blue Tooth ECG to Smart Phone. 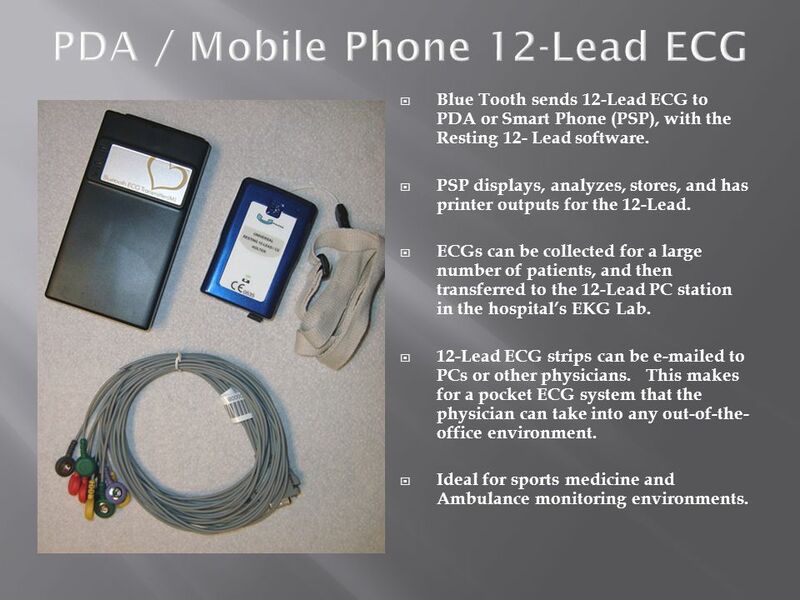 Smart Phone transmits 12-Lead ECG on demand or at pre-set intervals. Ambulance personnel receive verification for life-saving interventions. 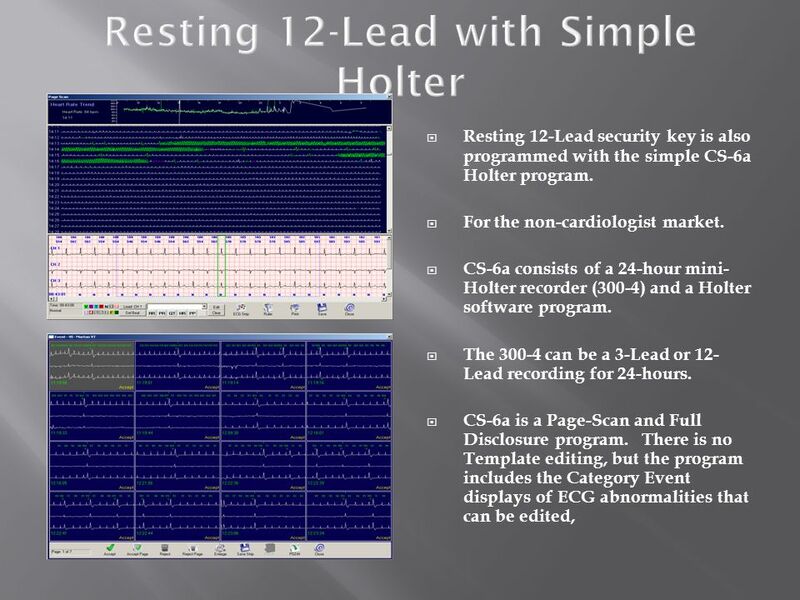 Upon arrival at hospital, 100% of Ambulance 12-Lead ECG is transferred to CS-12 for review in real-time mode and Holter mode. ECG continues in Emergency Room. 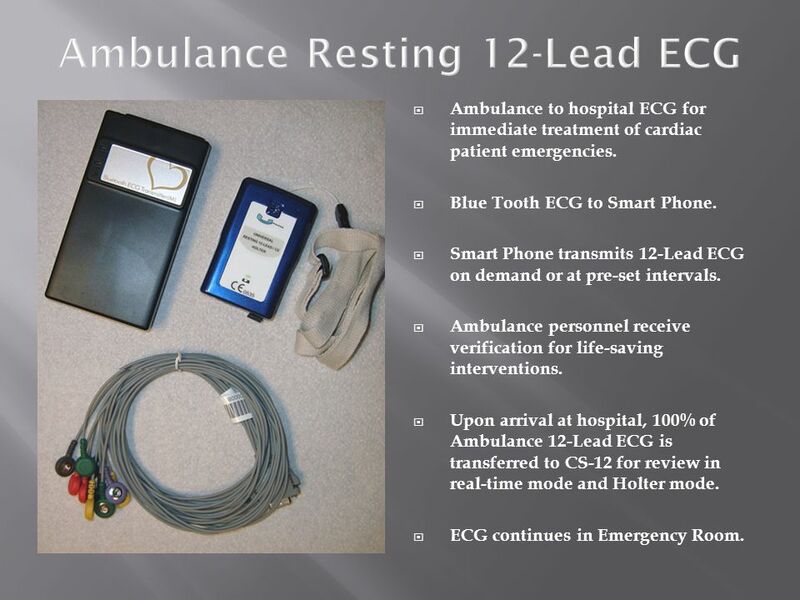 12-Lead Hospital Patient Monitoring with Blue Tooth. Single patient ECG station. 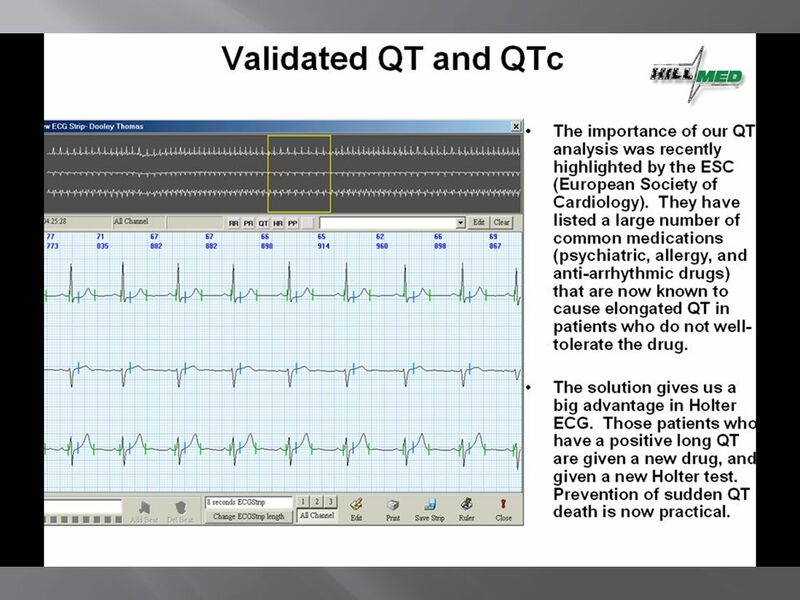 Analysis of: Arrhythmias ST QTc and QTd Heart Rate Variability Patient can be mobile with Blue Tooth Transmitter. Sample rate of 4,096 with 12-Bit resolution. Target Heart Rate % of Target Heart Rate Delta Heart Rate Change Elapsed Time The reference beginning ECG is shown at the far left side for each ECG Lead. 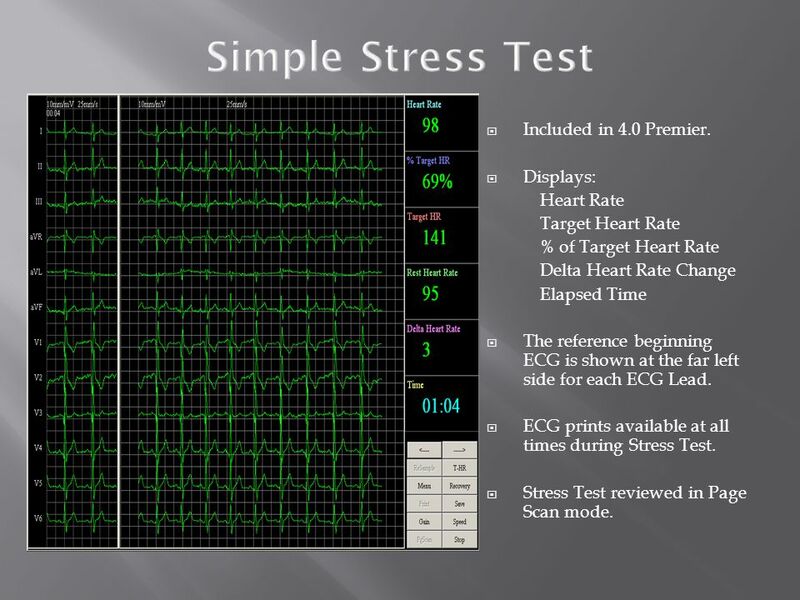 ECG prints available at all times during Stress Test. Stress Test reviewed in Page Scan mode. 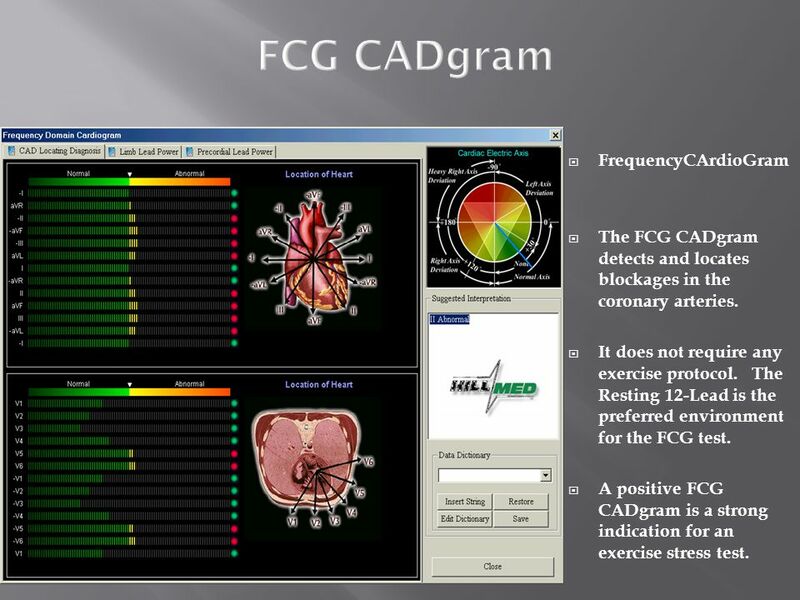 The FCG CADgram detects and locates blockages in the coronary arteries. It does not require any exercise protocol. 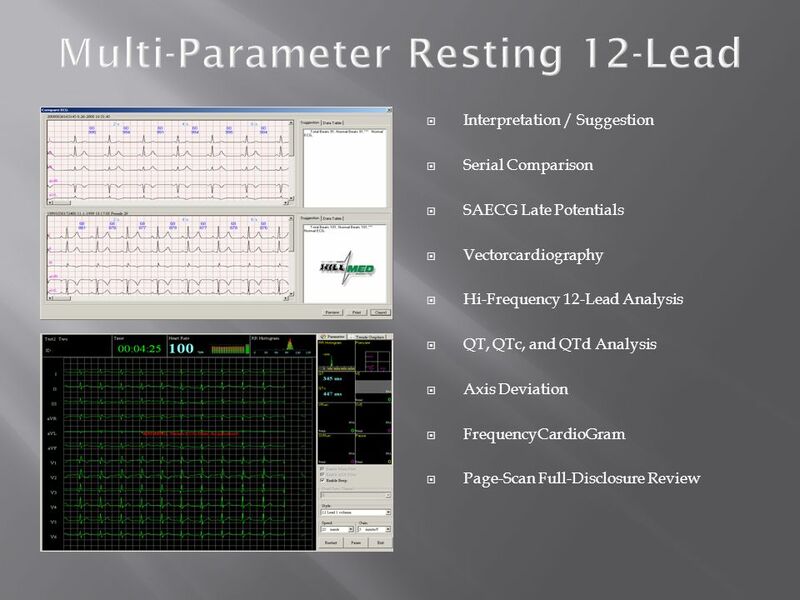 The Resting 12-Lead is the preferred environment for the FCG test. A positive FCG CADgram is a strong indication for an exercise stress test. 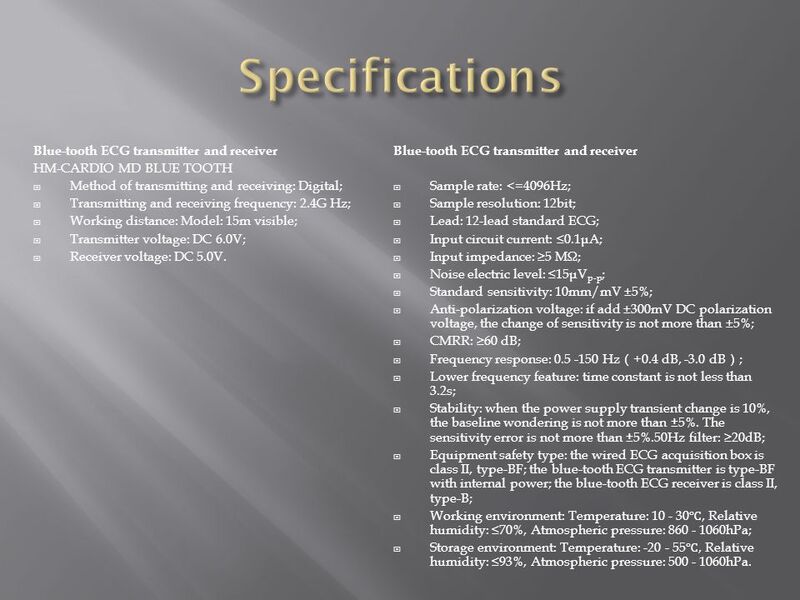 HM-CARDIO MD BLUE TOOTH Method of transmitting and receiving: Digital; Transmitting and receiving frequency: 2.4G Hz; Working distance: Model: 15m visible; Transmitter voltage: DC 6.0V; Receiver voltage: DC 5.0V. 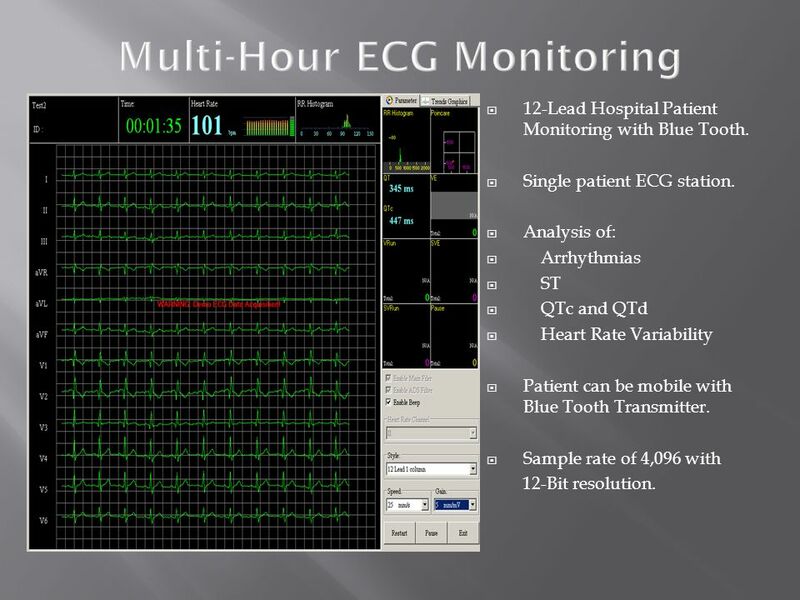 Blue-tooth ECG transmitter and receiver Sample rate: <=4096Hz; Sample resolution: 12bit; Lead: 12-lead standard ECG; Input circuit current: ≤0.1μA; Input impedance: ≥5 MΩ; Noise electric level: ≤15μVp-p; Standard sensitivity: 10mm/mV ±5%; Anti-polarization voltage: if add ±300mV DC polarization voltage, the change of sensitivity is not more than ±5%; CMRR: ≥60 dB; Frequency response: Hz（+0.4 dB, -3.0 dB）; Lower frequency feature: time constant is not less than 3.2s; Stability: when the power supply transient change is 10%, the baseline wondering is not more than ±5%. 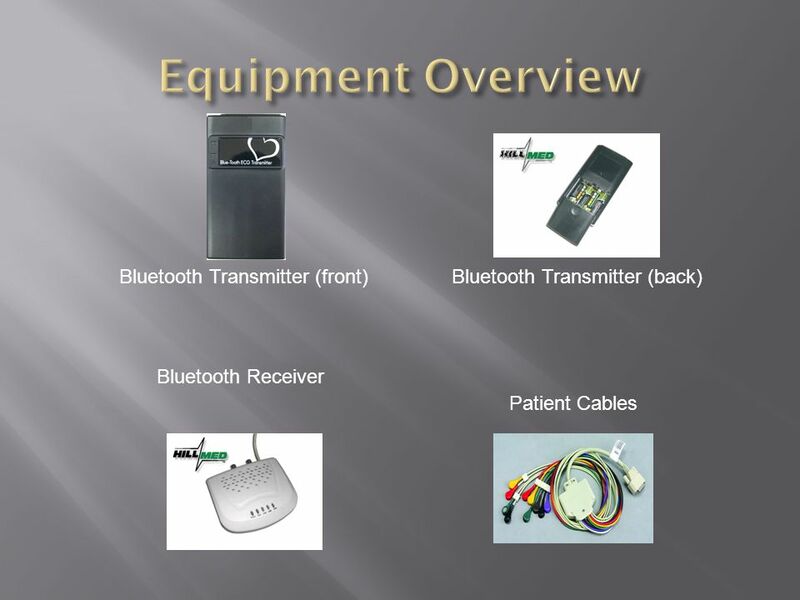 The sensitivity error is not more than ±5%.50Hz filter: ≥20dB; Equipment safety type: the wired ECG acquisition box is class II, type-BF; the blue-tooth ECG transmitter is type-BF with internal power; the blue-tooth ECG receiver is class II, type-B; Working environment: Temperature: ℃, Relative humidity: ≤70%, Atmospheric pressure: hPa; Storage environment: Temperature: ℃, Relative humidity: ≤93%, Atmospheric pressure: hPa. 1. 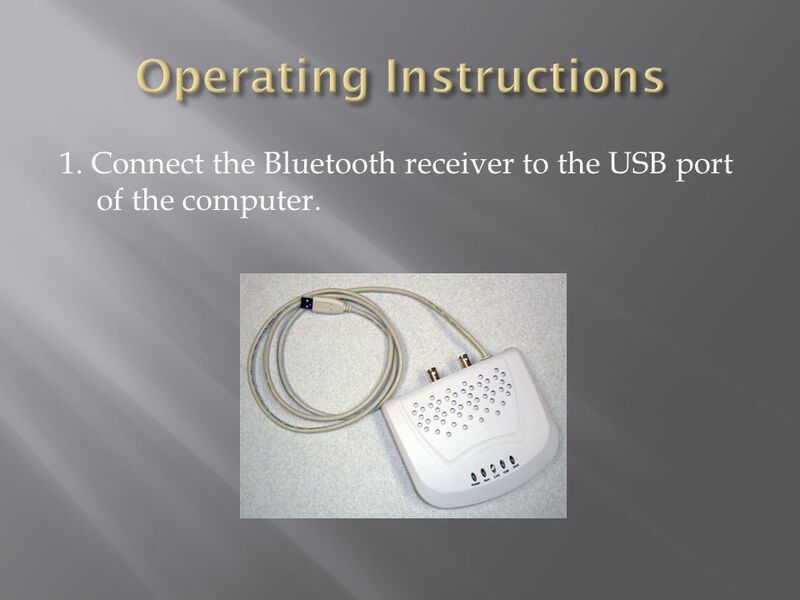 Connect the Bluetooth receiver to the USB port of the computer. 2. 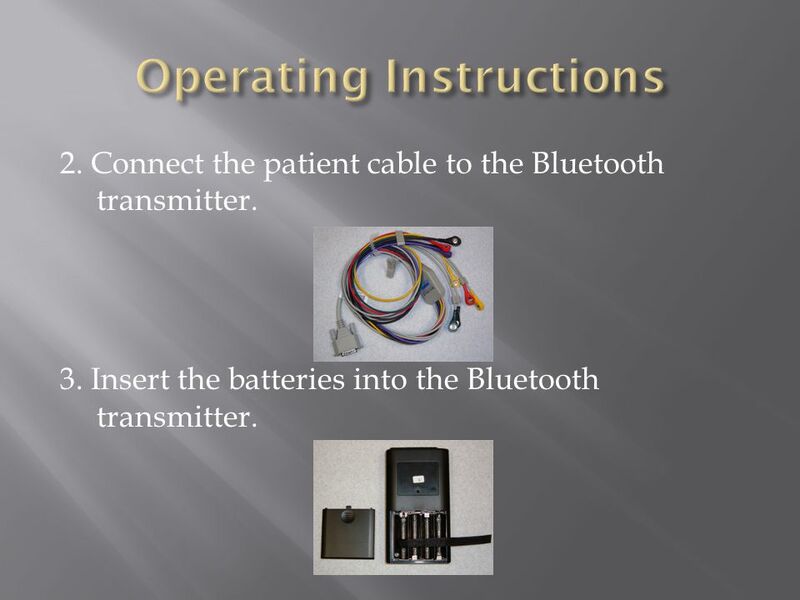 Connect the patient cable to the Bluetooth transmitter. 3. 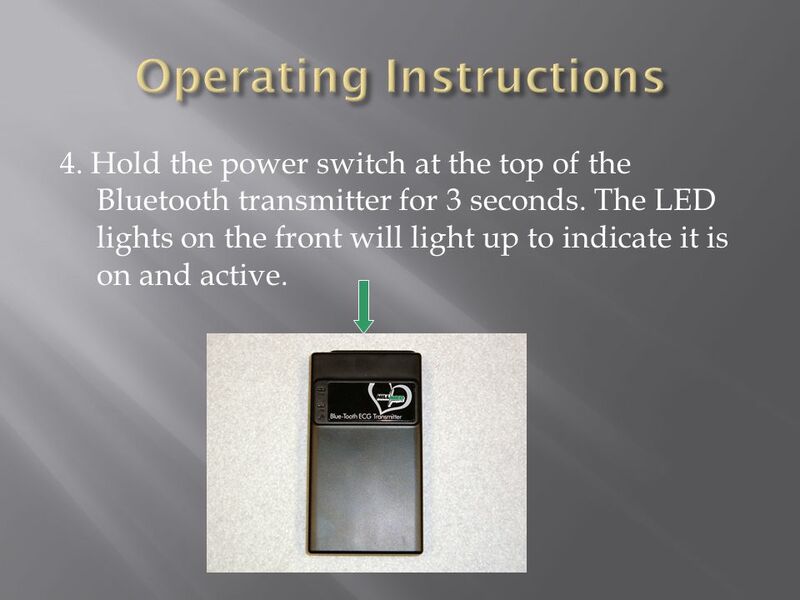 Insert the batteries into the Bluetooth transmitter. 4. Hold the power switch at the top of the Bluetooth transmitter for 3 seconds. The LED lights on the front will light up to indicate it is on and active. 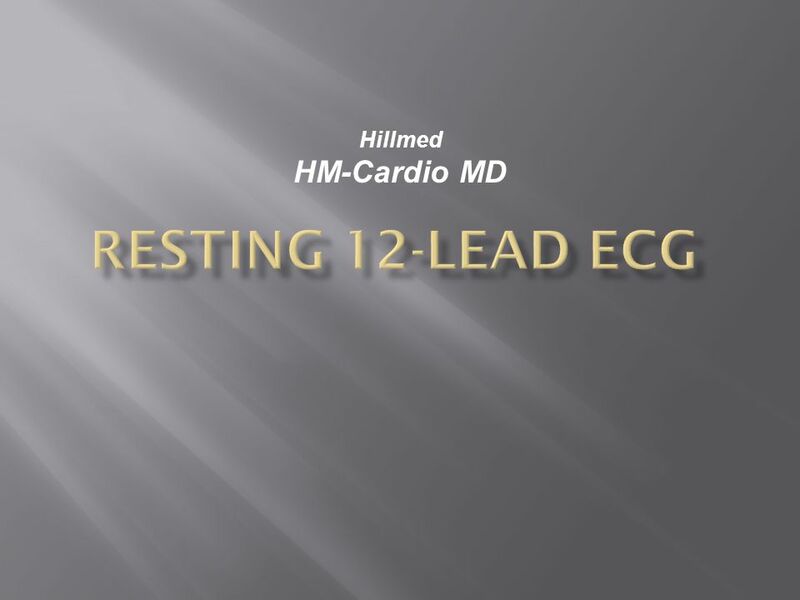 Download ppt "Resting 12-Lead ECG Hillmed HM-Cardio MD." Cardiac Cycle The two atria contract at the same time, then they relax while the two ventricles simultaneously contract. The contraction phase of the ventricle. IPS of Boston Checks On Demand! ® Welcome! To navigate this presentation, first click in this window, then use the arrow keys on your keyboard. Welcome! TURKEY AWOS TRAINING 1.0 / ALANYA 2005 TRAINING COURSE ON AUTOMATED WEATHER OBSERVING SYSTEMS ( AWOS ) MODULE C.2: COMMUNICATION SONER KARATAŞ ELECTRONIC. CS-100 CS Marketing Group, LLC. 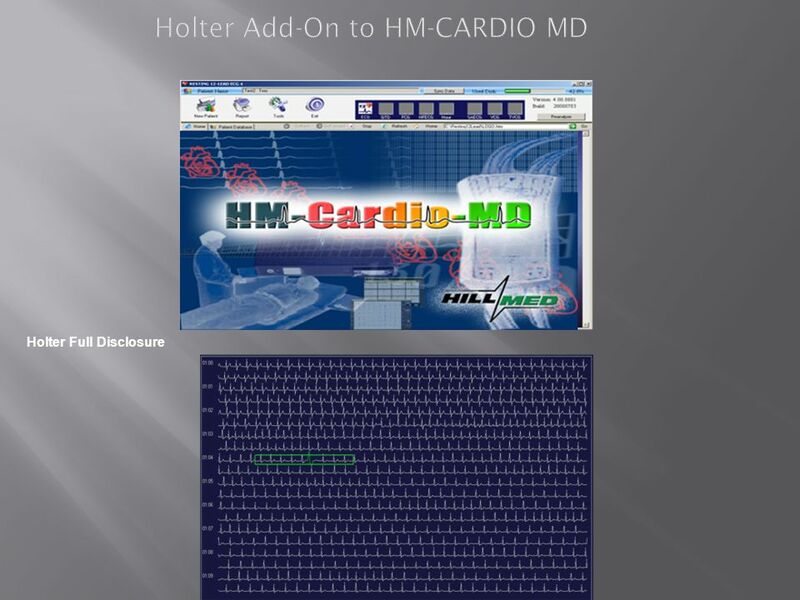 10/10/2014Copyright, Adams Meditech, CS-100 (CardioStation – Model 100) An ECG Acquisition and FCG (Frequency CardioGram) Diagnostic System A Preliminary. 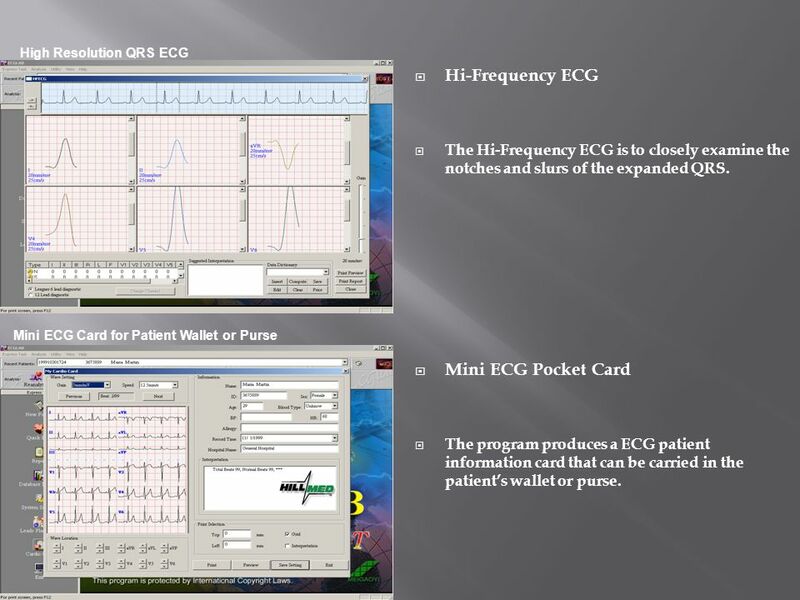 EDAN PC ECG An electrocardiogram (ECG) is a test that records the electrical activity of the heart. An ECG is very useful in determining whether a person. XScribe 5 November 2011 Medica 2011 Presentation. 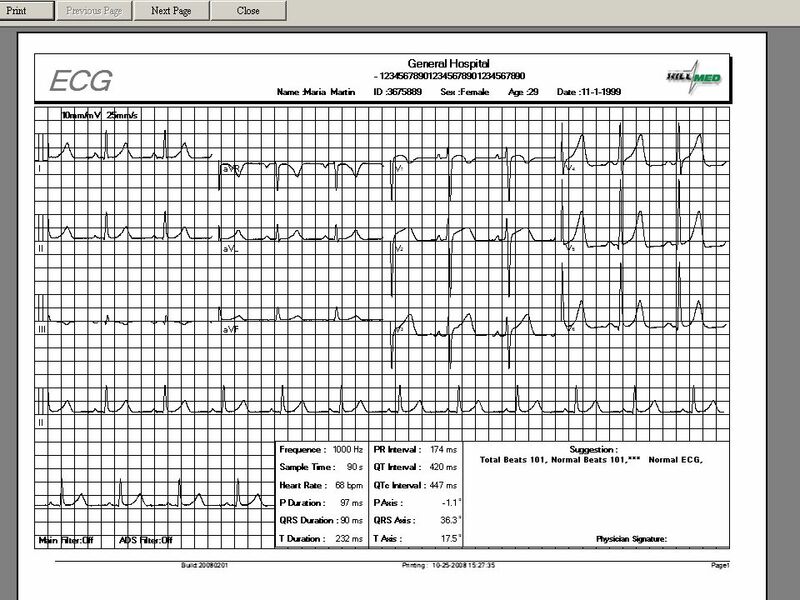 1 STEMI PROTOCOL UNION HOSPITAL EMERGENCY DEPT.. 2 Presentation of Patient Patient presenting to ER with acute chest pain suspicious of cardiac origin.